Do you enjoy seeing what other people have in their shopping cart? I sure do. Today I am sharing with you some of what I buy at one of my favorite places to shop – Costco! I have already shown you what I buy at Trader Joe’s and Whole Foods Market. 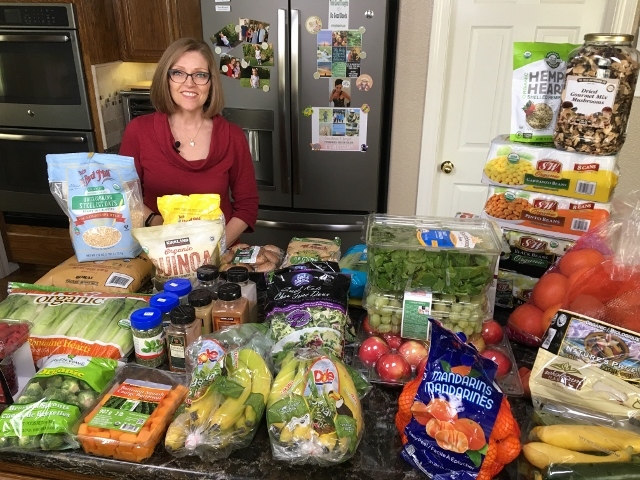 Recently I have been getting a lot of requests for a Costco shopping video – blog post. On the way home from our last Costco excursion I asked hubby Tom, aka the “Nutmeg Notebook Camera Man,” if he wanted to make a video when we got home. He was practically jumping for joy as he loves to set up all of his studio equipment and play with his camera! This was a particularly large shopping spree and we also pulled out of the pantry and freezer items that we previously purchased at Costco. 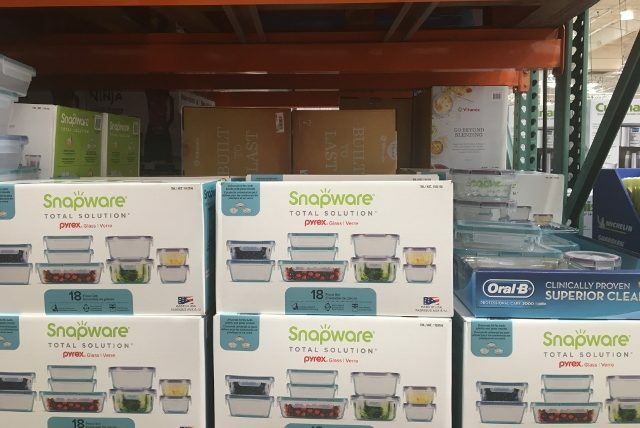 You are getting a pretty good look at our favorite Costco finds. There certainly are more processed vegan products that are sold at Costco they just don’t happen to be on our list of healthy whole food plant based menu items. This video was recorded prior to the most recent romaine recall! We hope you enjoy this shopping spree and video. We welcome your ideas and suggestion for future videos and blog posts so feel free to leave us a comment and we will do our best to fulfill your wishes. Believe it or not there were some items I forgot to pull out of the pantry or fridge so they weren’t included in the video. These are so delicious we love to add them to our Nourish Bowls. Toss them in a non stick skillet with some water sauteed onions and mushrooms, put the lid and let them steam. Yummy! 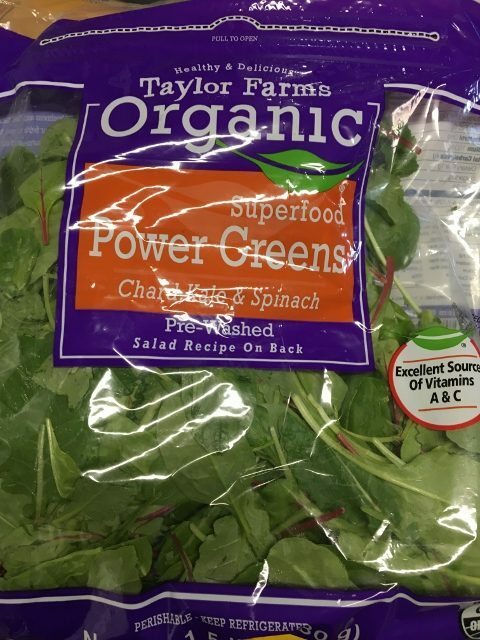 You can add them to your Big Beautiful Chopped Salads, in your Green Smoothies, chopped and tossed into your soups. Put a pile of them in the bottom of the bowl before you add Chili Soup or Stew– it boosts the nutritional value of your meal. 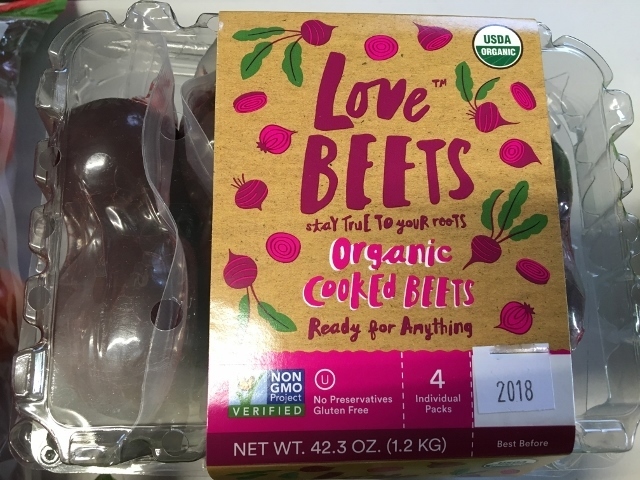 Do you like beets? I happen to love the flavor but people seem to either love them or dislike them. These are already peeled and cooked. All you have to do is enjoy eating them. I like to dice them and add them to an already Chopped Salad. You can heat them up if you prefer them hot. Beets are super healthy read all about this powerful root vegetable here. 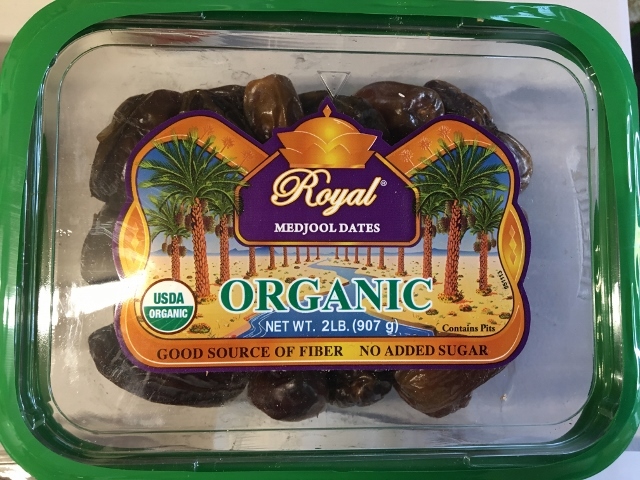 Medjool dates are large, sweet and soft. Perfect for adding a little sweetness to the ever popular oil free Creamy Balsamic Dressing. They add just the right amount of sweet in the Curry Quinoa Stuffed Acorn Squash. I freeze them right in the container they come. I don’t use them very often but it’s nice to have them on hand when needed. 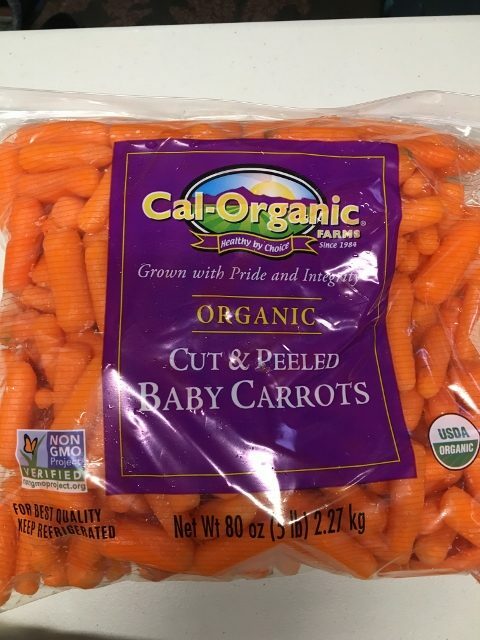 No need to tell you what to do with baby carrots. However I think you would enjoy dipping them in the Best No Oil Hummus. This is sold as a 4 pack. 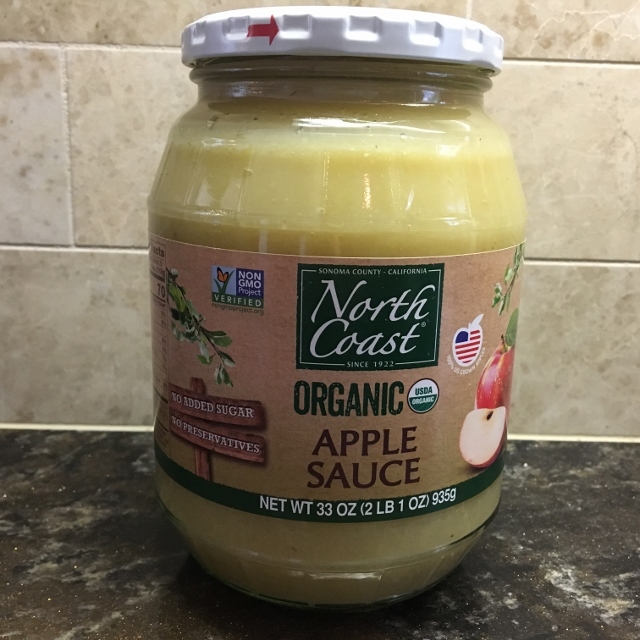 If you open a jar and can’t eat it all before it spoils go ahead and put it in a freezer safe container and pop it into the freezer. I buy this to make my Quinoa Banana Oat Muffins – they are so good. Have you tried them yet? 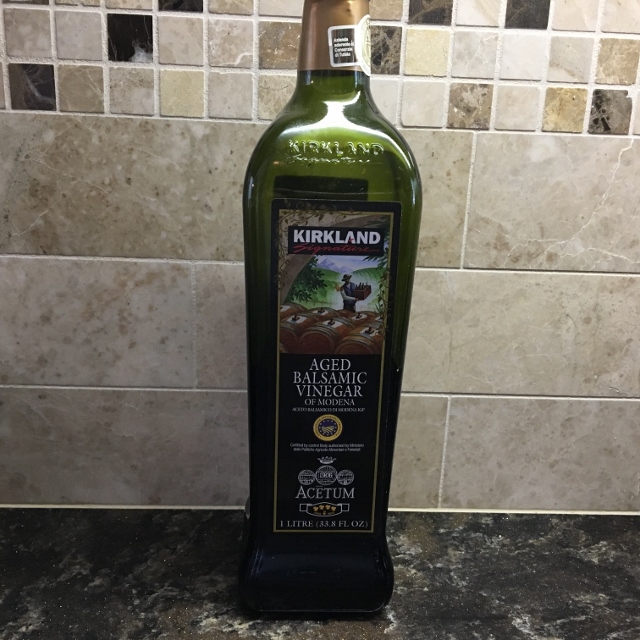 You all know how much I love using vinegars and the flavored ones are high on my list of favorites but so is this plain balsamic vinegar. It’s perfect on greens, rice, vegetables and this is the one I use to make the Creamy Balsamic Dressing. It’s a good price and a big bottle that lasts a long time. 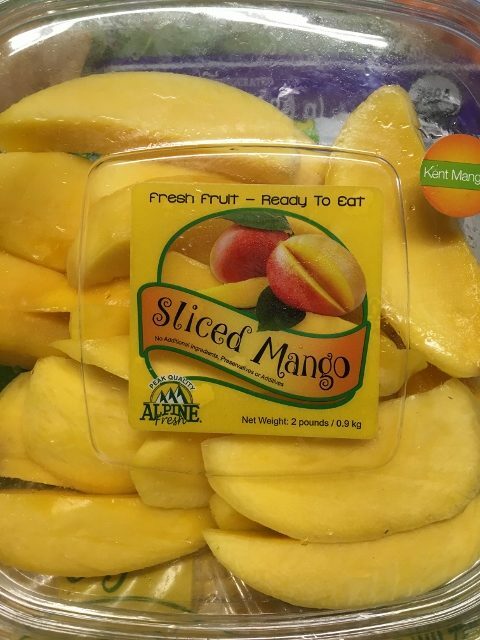 These already sliced and peeled mangoes make life easy. I really don’t like peeling and slicing my own mangoes so when I want to use them – this is the route I choose. You can make a nice little mango salsa by dicing them and adding a little diced red onion, freshly chopped cilantro and some fresh lime juice. That becomes the perfect side dish to these amazing Slow Cooker Black Beans. Okay I admit it, I have a small kitchen appliance addiction! 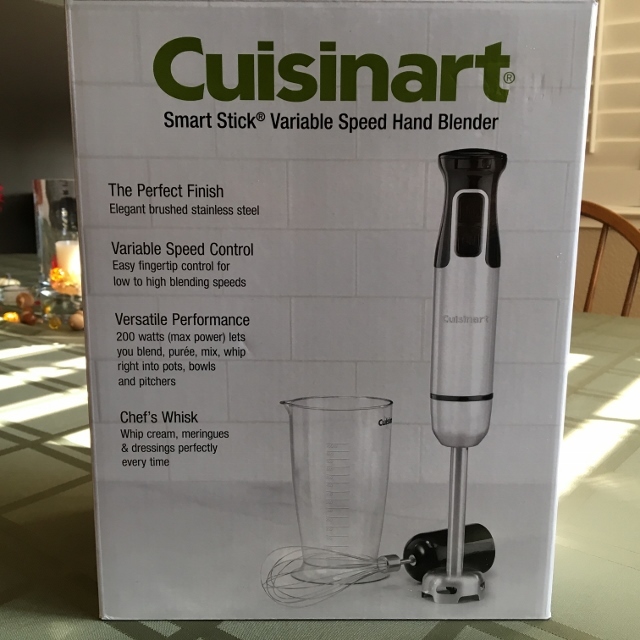 My old stick blender was on it’s lasts leg so when I saw this at Costco recently it had to come home with me. It is super powerful and works like a charm. My daughter also got one and the first time we both used them we over blended our soups! It eliminates the need to ladle the soup into your blender jar and having to blend soups in batches. These are the perfect storage containers for all the Batch Cooking that we do. For those of you who are new to my blog – I batch cook food each week so we always have our own healthy “fast food” in the fridge and freezer to choose from. It saves me so much time in the kitchen during the week. We currently have three sets of these containers from Costco. I like that you can clearly see what is in each container when you open the fridge. I love my Scanpan skillet and use it all the time – in fact it stays on my stove because we use it so much. Having said that, I still think the T-Fal non stick skillet is awesome and it’s under $20. You can steam veggies in it, water saute veggies and onions in it no problem. I also use it to brown homemade veggie burgers without using oil. 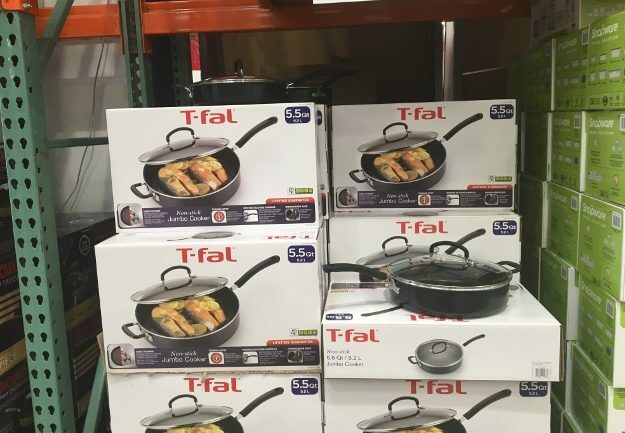 It makes a nice gift for anyone who loves to cook. I have an Amazon Affiliate Recommendation Page that features products I love and use. When you purchase items through my links you help support the work here on Nutmeg Notebook without any extra cost to you. Thank you for your support! 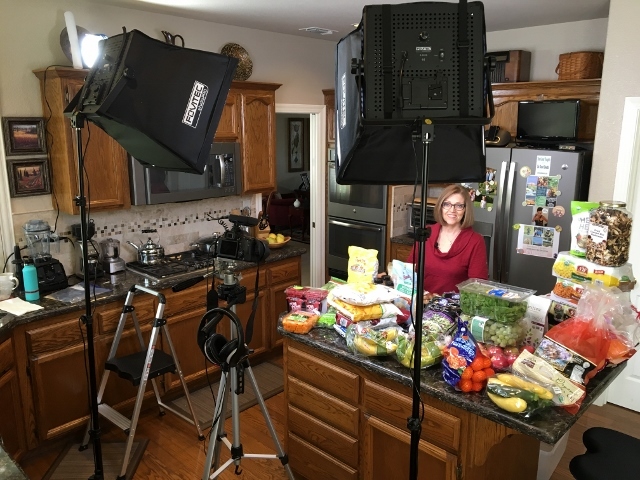 Behind The Scenes of a video shoot in the Nutmeg Notebook kitchen. We made it through Thanksgiving with about half the family sick! Colds, sore throats and fevers were dropping us like flies. I was really looking forward to having a long weekend to catch up on some things and maybe even getting my house decorated for Christmas. Well that didn’t happen – I didn’t even come close to getting anything done. Sometimes you just have to listen to your body and rest. That isn’t easy for me to do. Things will eventually get done, the house will get decorated and if not it’s not the end of the world. I am learning to take things as they come and go with the flow. Since I was having down time – this blog post became more than just a thought! That was the silver lining in not feeling well over a long weekend I guess. This is such a busy time of year – be sure to say no to things you really don’t want to do so you will have time for the people and the events that bring you the most joy! Life is too short to waste any of it. I am really saying this outloud to myself – I need to hear it! Mastering the art of rocking two babies asleep at the same time. The twins D & E as well as big sister “Sweetpea” are keeping us busy these days! They are all growing too fast. Children and grandchildren are such a gift to behold and we are delighted to be able to spend as much time with them as we desire. Life is pretty amazing. We are feeling truly blessed. 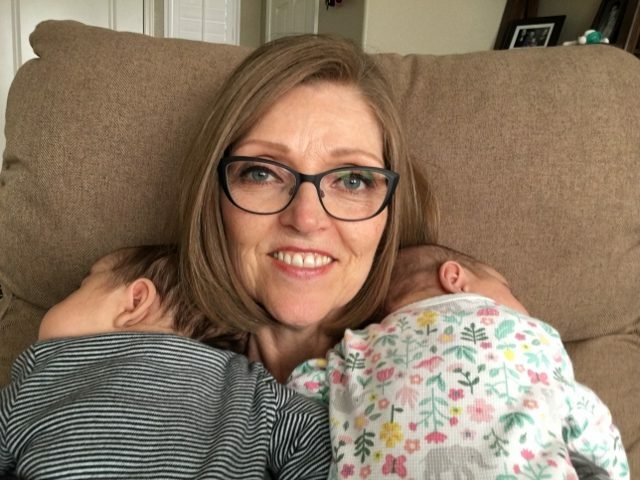 Thank you so much for sharing about your own twin grandson’s. It is such a blessing to be a grandparent. Thank you for this post! I just found you through Chef AJs work. I appreciate all that you do. I amnew to this and it is so helpful! Btw. The twins are precious! Hi and thank you so much for leaving comment. Welcome to the wonderful world of plants! Hi Tami, We just watched your video. Thank you so much for all the tips. I’ll have to watch again and make a list. That way I can look online before making the long trek to our one and only Costco. Always good to have a plan anyway. You’re amazing. Thanks again for all you do! I am so glad you found the video helpful! Have fun shopping! It is the Roseville Store. Thank you for sharing this as it makes easy to shortlist the items based on their price and even the links provided helps in just purchasing them. Keeping posting! You are welcome! Happy Shopping! Hi Tami, I just found your website. My sister, Robin Bennett, sent me your way. Loved the Costco haul! I’m sure you have information on budget-friendly shopping on your blog. But, maybe you could point me to a post or two. We have $400 a month for a family of 5 (6 when my oldest is home from college). Our sons are age 22, 19, 14, and 10. We all know how much boys eat. LOL! We do have a yearly CSA membership (which is not included in that $400 a month). So, I base my weekly menu plans off of our weekly CSA box from mid-April to late October. Thanks so much! Love this post! I just shared in on our local plant-based FB group page here in Reno NV. Can you tell me where I can find the recipe you mention in the video that you use the Costco bagged salad for? I would love to know. Your balsamic white bean salad dressing is our go-to salad dressing – it’s my 17-year-old daughter’s favorite! Thanks for all that you do! I really love this post also. I only have access to a Sam’s club and wish I had access to some of the products pictured. Thanks for your blog, I love it! I also found you through Chef AJ and wanted to say the picture with your grandbabies is ADORABLE! I loved this video. I don’t have a Costco near me in NW Arkansas, so I shop Sam’s Club and Whole Foods and Natural Grocers. Your countertop looked like mine after a big shopping adventure. To think how I used to eat years ago, compared to how I eat now, is totally amazing. I love spreading everything out after unloading it from the car, and see how HEALTHY I eat. Fun, huh! Thanks for your great videos where you always include wonderful storage and cooking tips. I feel the same way you do after shopping – so happy to know the right way to eat and feel good about how I treat my body! I wish everyone knew what we do that is whey my hubby and I have the blog now and the You Tube channel. Getting positive feedback like yours keeps ups going! Thank you so much for taking the time to leave us comments – it is greatly appreciated.